Now that it’s a little further along, here is an update on the aforementioned comic. It is an collection of short stories called “Other Tales” or at least it will be once I do the English translations for now it’s called 他物語 (hokamonogatari). 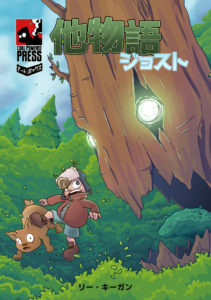 The first issue is finished and will be debuting at a small comic market in Sapporo this Sunday. Since I’m now living in Japan and have access to a whole world of wonderful manga supplies basically everywhere I turn, I have begun working on a new comic. The first traditional media comic intended for print publication I’ve attempted in… 6 years I think. 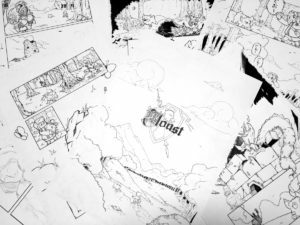 However unlike “A Rindice Fairy-tale” which fizzled out in the first issue, I already have the first three chapters of this comic in various stages of completion (from fully written to finished inking). I am also in the process of putting these stories together into a print book to take to some doujinshi events around Japan so I’ll be posting more on that as it develops.